The Boeotian Helmet originated in Boeotia, which is a region of Greece. 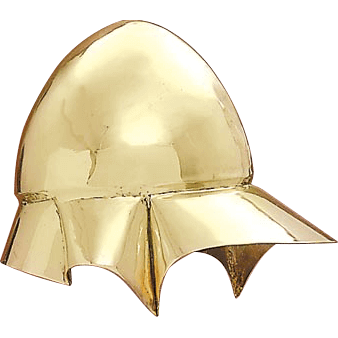 The helmet is modeled after a folded down sunhat and is designed to provide for unimpeded hearing and vision, and thus it was primarily used by cavalry and mounted soldiers. The helmet is modeled after a sunhat whose visor has been folded down, which provides a protective visor around the helmet as well as a rounded cap that provides excellent protection to the top of the head. The visor around the brim of the helmet folds down at the back of the neck and flares out slightly at the sides and front, which offers protection along the sides of the head, while also keeping the wearers vision and hearing almost completely unobstructed. 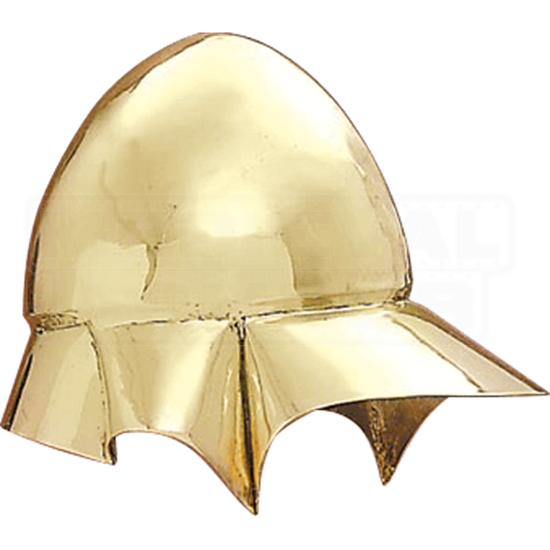 The helmet also features an attractive, polished brass finish that gives it a classic, historical look. For a collector, the interesting and rare pieces are the real finds, and the Boeotian Helmet is a lesser-seen Grecian helmet that makes as great an addition to a collection as it does when worn by a re-enactor into battle.